We can take care of the whole project for you or just the build. We are NHBC & CITB registered. Call now to make an appointment at our showroom. 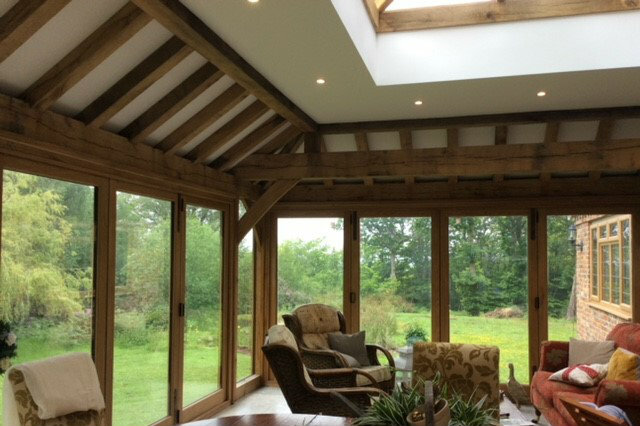 Exquisite, yet practical extensions for your home. Contemporary designs, built to last. Not moving? You're in the right place. If you’re considering an extension to your property, you’re not alone. The majority of work we carry out is of this nature. If you decide to take us on, you’ll get our full turnkey service, which means we’ll manage the whole project from start to finish, with your input where you’d like to provide it. Why don’t you tell us what you’re trying to achieve? We know there could be many reasons you’re considering an extension to your home, and that any investment of this size demands much consideration. We’re here to answer your questions and help you find the best solution. As with our house builds, we offer a full turnkey solution, or a stand-alone, build only service. We can project manage from start to finish, taking care of every aspect of the build including plumbing and heating, plastering, joinery, furniture installations, electrics, roofing and everything else in between. If you've just decided you'd like an extension, we can help you from the beginning of the journey, with a thorough site survey where we can advise on required planning permission. Should permissions be required we'll liaise with the local authorities for you, to ensure the extension complies fully with UK Building Regulations. If you've already got planning permission and designs, we're as happy just to carry out the work to your exact specifications. What kind of extensions do you build? Single and two storey, side extensions, front or rear, side return, wrap-around, the list goes on. Suffice to say, if you’ve got the space and the required permissions, we can build it for you. What kind of extension can we have at our property? This largely depends on the size, age and type of property (detached/semi/terrace) as well as the position of your house in relation to your neighbours. Planning permission is not always required, for example you don’t need to have it to extend a single storey of a detached house by eight metres or less at the rear, provided it’s not more than four metres tall, is built in the same style as the rest of the house, and doesn’t result in more than half of the garden being taken over. As with any extensions, we always advise you check with the relevant authorities. Aside from planning permission, what else do I need to consider? Above all you need to think about how the space is going to be used and how much natural light you’ll let in. Think about where you want the furniture to go and storage. This is especially true for the most popular type of ground floor extension we carry out - kitchen extensions. The other big one is whether or not to go for two storeys. If budget doesn’t allow, but you would like the additional storey at some stage in future, then you need to advise us from the outset. You need to think about your boiler and whether its position is appropriate to what you have in mind, and that it’s in good enough condition to perform whatever purpose is required. You also need to consider electrics, sewage and so on. We work with a number of partners to assist with our house builds and extensions. They share our Home Design Centre with us, which you’re welcome to visit to get a feel for the styles, ranges and so on. 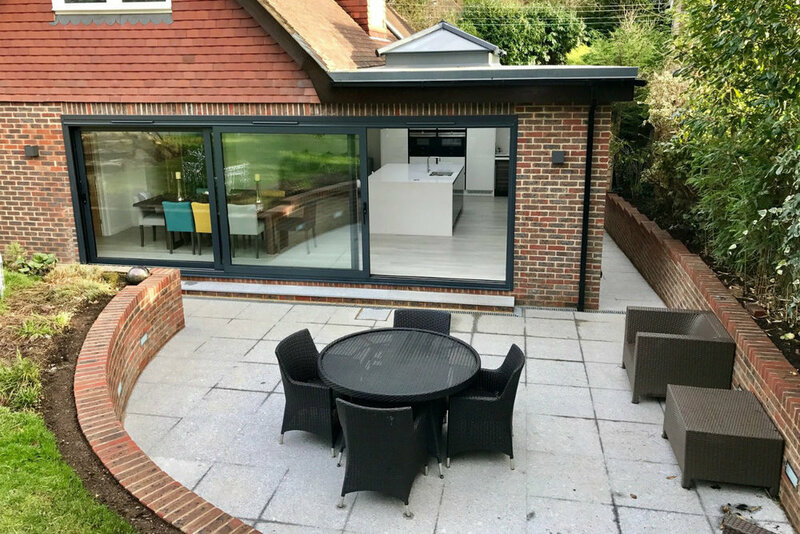 For the vast majority of our extensions we fit kitchens by Hehku and bi-fold doors and windows by NuGlaze Home Services. 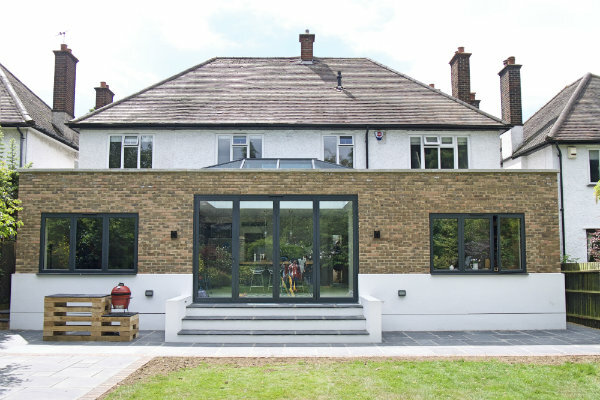 When it comes to sun and garden room extensions, this is a question we’re asked all the time, and the honest answer is, not a lot! An orangery typically has brickwork below the windows, and as such feels like a more natural extension to the house. A conservatory has floor to ceiling glass on the walls. Will you help with the design? We certainly can, and we’ll discuss your requirements at one of the early consultations to form a brief for our in-house architect, who will liaise with our structural engineer and project manager. Likewise we’re happy to work from your plans, provided they have the required sign off, and we’re absolutely clear on what’s required. What input will we have? Assuming we’re creating the designs, you’ll be involved from the very start. We’ll provide you with some options, and you can even be involved in the decisions regarding materials, and of course, the finishes. As I’m sure you understand, with so many different options and permutations, it’s impossible for us to even provide a guide on the cost of your extension, until we know what’s required. What we will do is provide a ballpark estimate following our initial consultation, which we’ll firm up into a fixed price after we’ve discussed it further, before work begins. How long will it take and do we have to move out? 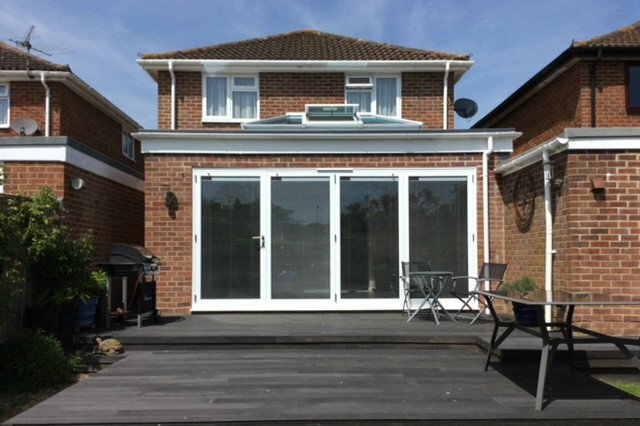 A typical home extension, if there is such a thing, takes anywhere between three to six months to complete, from the day the project is signed off by planning. Of course there will be disruption, which we’ll do our best to keep this to an absolute minimum. We wouldn’t expect you to move out whilst we complete the work. Once we have agreed the scope of the project, we'll look for you to sign a fixed price contract so there are no unwelcome surprises when the project is finished. We have one of the largest showrooms in the south east of England. From here we'll be able to show you some of the solutions we can provide, including Hehku kitchens and NuGlaze windows and bi-fold doors. If you've just the had the idea of extending your own home, or you have drawings and planning agreed, we'd love to hear from you.